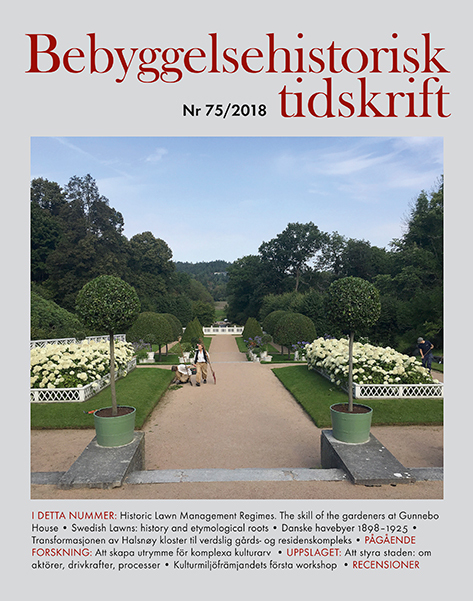 Bebyggelsehistorisk tidskrift is a Nordic forum for research and debate on the history of the built environment. Our publication languages are Swedish, Danish, Norwegian and English. The journal views the history of the built environment with a broad perspective, from a starting point of how people have shaped and acted in built and created environments. BHT presents the latest research on the history of the built environment, and also provides a forum for discussing the discipline in practice when buildings and heritage environments are being conserved. The periodical is the Nordic region’s leading academic journal on the history of the built environment. Each published academic article is assessed by the editorial board, and by two anonymous referees in a double-blind peer review.